As you’re probably aware (you certainly will be if you live in Scotland or one of the other UK countries! ), on 18 September people on both sides of the Scottish independence debate – “Yes” voters, who want independence, and “No” voters, who want to stay with the United Kingdom – will be casting their votes. And in spite of their opposing stances on Scottish independence, both sides will have one thing in common: they’ll each be voting to “cleave”. The “No” voters will express their desire to cleave to the United Kingdom, and the “Yes” voters their desire to cleave from it. Because “cleave” is one of those odd words in English that contains two contradictory meanings. Both words started out from different roots, but their spelling has converged over time. From the Old English cleofan, cleven, cliven, from Proto-Germanic *kleuban. Past tense: clove or cleft or cleaved; past participle: cloven or cleft or cleaved. This version of “cleave” gives us terms like cloven hoof, cleaver and cleavage (about which, see below). “Cleave”, version 1, is normally used to denote a clean and irrevocable split (imagine a butcher’s cleaver chopping through bones). From Old English clifian, cleofian, from West Germanic *klibajan. Past tense and past participle: cleaved. “Cleave”, version 2, is frequently used to describe a very strong and emotional attachment to a person or belief: such as allegiance to a nation or family of nations. Returning briefly to cleave no. 1, for most people nowadays the related word “cleavage” is associated with low-cut necklines. Or possibly builders’ bums (shudder). 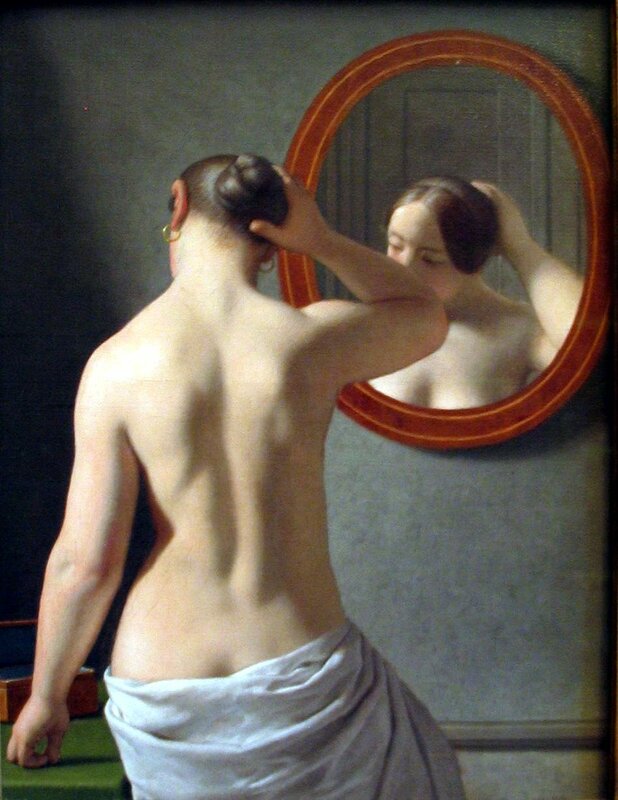 The women in the painting above, Morning Toilet by Christoffer Wilhelm Eckersberg (Source: Wikimedia Commons), offers both varieties. As for the Referendum – I’d be so upset if we left the UK! Now we know, indeed. I suppose every language has verbs of the sort, I know Arabic does. That’s what makes languages fascinating. Thank you Marian. Indeed – it’s all the little quirks of languages that make them both fascinating and fun!